Seeking Boston Marathon For Sale? With the new Boston Marathon registration system, unless I change my name from Tyron to Sharon I will not be able to register this week for the 2012 running of the Boston Marathon. If you've read my blog (thank you) you know that I've taken a Maniacal Sabbatical from marathon training due to cramming too many marathons in too short a period of time (five in 18 months.) As a result, while last year I was nine minutes under my BQ, this year I hit it on the nose. A 3:30 in Portland. While I feel blessed to have run not one but two Boston's, that just makes you want more. I do live in the most gluttonous country in the world. With the new semi-complicated system, I can't try and register until next Monday assuming there are slots left. Considering last year's registration was sold out before parts of the world woke up, I'm not exactly hopeful I'll be lacing them up in April. Given that, what do I do for 15 months with a blog named, "Seeking Boston Marathon." Ironically, I started this blog when I was recovering from a stress fracture in my lower left leg I ran on in Chicago and I had yet to qualify. Starting the blog held me accountable to the internet. It worked and I qualified in the next race I ran (Sacramento's CIM.) Once I'd finally run on hallowed ground, someone from twitterland asked me will I change the name to "Sought Boston Marathon?" while it made sense, it didn't. Lays potato chips. Once you have one, you can't stop. Gluttony. Still seeking Boston. Soooo...if I don't get in next Monday, what do I do with the blog name and my time? 1) Rent it out to the highest bidder? No, but guest bloggers with the same goal may be a thought. 2) Change it to Seeking New York? I am within 2 minutes of a NYQ so I've given it thought, but would not want to turn my back on the greatest race in the land for the second greatest. I do move into a new age bracket next July, so I've got my eye on July races to try and notch NY on my marathon belt. 4) Ty's Home Decor and Fashion Tip Blog? Vomit is forming in my throat. 5) Keep the name and go after marathons within two months of Boston that I've always wanted to run, but were too close to Boston; the Colorado Marathon and the Flying Pig are hovering in the back of my mind. 6) Run away like Forrest from this and another demon. Canada has a nice ring to it, but nasty in April. Man up Tyrone! 7) Seeking Ironman? As in race an Ironman. While I have got hooked on triathlons this summer, I don't have the time to dedicate to Ironman training with my travel schedule and remain married. This is on hold for now, but just like I obsessed with Boston, I have taken the same approach to triathlons. During my marathon "time off" this summer, I have raced in three triathlons in the last month and a half. Apparently, I was a better swimmer than I thought I was. Three races, three podiums. It took me ten years to podium twice in running--ten years apart. I'm hooked on TRI's. 8) Barista...in Canada? No...see number six. 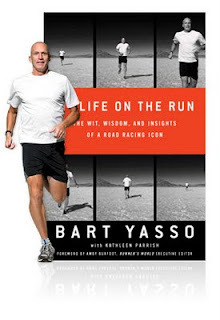 9) After reading Bart Yasso's "My life on the Run," go after some of racing's alternative races; run with the burros like he did, a naked 5K (certainly not in the winter and my family would disown me,) and/or the Gorilla Run (a Guinness world record race in the making)--can you imagine a 5K loaded with runners in Gorilla suits or birthday suits? 10) Seeking Boston Marathon. I've printed the stickers and Boston runs in my veins. I don't think the name is going away anytime soon. Ironman, Ironman, Ironman!!! Come do St. George in May 2012!